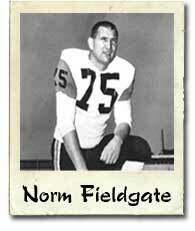 Norm “Mouse” Fieldgate was born January 12, 1932, in Regina Saskatchewan, and was a member of the first Lions’ team in 1954. Fieldgate’s early football years were spent playing for the Regina Rams of the Canadian Junior Football League. After being recruited by the legendary Annis Stukus, Fieldgate was the first player signed by the Lions and spent his entire 14 year career with the club. Fieldgate is widely regarded as one of the best of his time. The Norm Fieldgate Trophy, awarded to the most outstanding defensive player in the West Division is named in his honour. Fieldgate, along with teammate By Bailey were the only two original BC Lions with the club when the Lions won their first Grey Cup Championship in 1964. He was named a CFL Western Division All-Star Team as a linebacker in 1959, 1960 and 1963, a year in which he was also named to CFL All-Star team. Fieldgate played 223 games for the Lions and played at a variety of positions over his career. Although linebacker was where he made his mark, he also played downs at the defensive end, offensive end, corner linebacker and defensive back positions. Fieldgate was not a large man, but he oozed talent and natural athletic ability. Following his career, Fieldgate created a successful business, and also served on the board of directors for the Lions in the 1980’s. He still resides in the Vancouver area and is an active member of the team’s alumni.